Winnipeg will continue to see seasonably cold temperatures with benign weather through the weekend. Manitoba will be unable to escape the grasp of an Arctic high that has been bringing extreme cold to Saskatchewan the last few days. Because of this, the next few days will bring fairly similar temperatures with quiet weather. Today will bring diminishing winds with some cloudy periods as a bit of low cloud moves southwards out of the Interlake. After a clear start to the evening, a disturbance moving through the northern United States will spread cloud cover back into the Red River Valley overnight. Saturday will bring cloudy skies to the region, then clearing will follow on Saturday evening. Sunday will leave the area with mostly sunny skies. This map of 850mb temperature anomalies shows the wide extend of colder-than-seasonal temperatures across the Prairies. Temperatures all three days will be well below-seasonal. Friday will be the coldest with a high near -23°C, while the weekend will bring highs close to -20°C. Overnight lows for the upcoming 3 nights will hover close to -30°C. Forecasts show a snow-free weekend for Winnipeg, although some light snow is possible close to the U.S. border on Saturday. Next week will likely start with a return to near-seasonal temperatures as an inverted trough spreads cloud and snow across southern Manitoba. 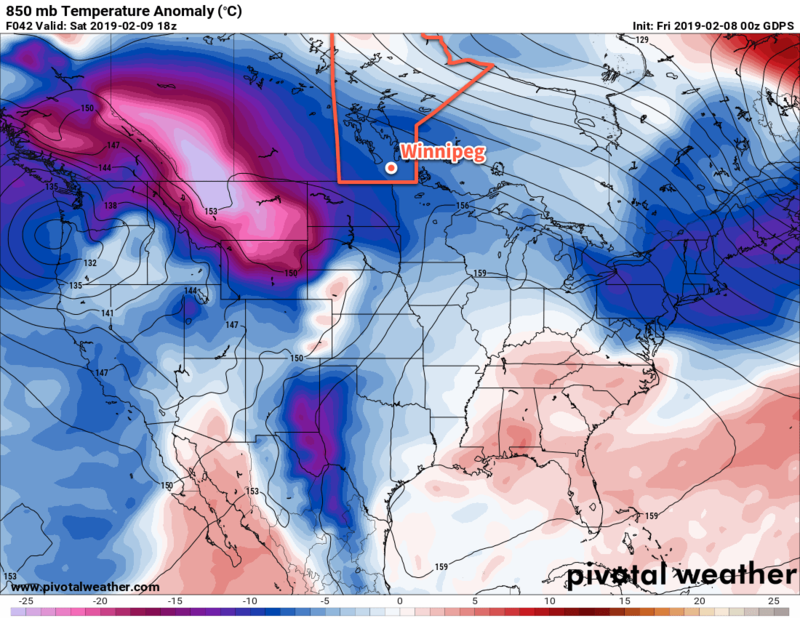 Winnipeg will return to slightly colder conditions midweek with variable cloudiness. Today’s seasonal daytime high in Winnipeg is -9°C while the seasonal overnight low is -20°C.